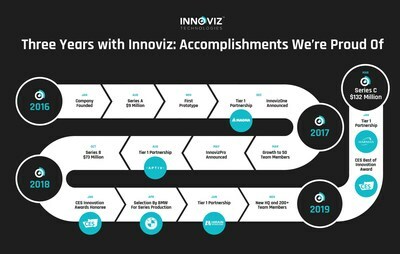 ROSH HA'AYIN, Israel, March 26, 2019 — (PRNewswire) — Innoviz Technologies, a leading provider of high-performance, solid-state LiDAR sensors and perception software, announced today that it has raised $132 million in Series C funding. The round is marked by the entrance of new major investors China Merchants Capital (SINO-BLR Industrial Investment Fund, L.P.), Shenzhen Capital Group and New Alliance Capital; and Israeli institutional investors Harel Insurance Investments and Financial Services and Phoenix Insurance Company. Given demand from additional investors, the Series C round will remain open for a second closing to be announced in the coming months.